One of our longest running and most beneficial partnerships is with the Baugher family, owners of Adams County Nurseries, which recently celebrated it’s 110th anniversary. These expert growers of nursery stock for orchards and back-yard enthusiasts all over the country specialize in varieties we love–the ones that taste the best! They have extensive acreage in production to help ensure that their grafting material and root stocks are of the very highest quality. When they have something ripe and ready for market, we go to their orchard and bring it back to our farm for sale or use in our kitchen. We love that they don’t “over manage” their fruit production, and that we can get “run of the tree,” ungraded apples. Catoctin Mountain Orchard, along with it’s farm, bakery and market are owned and operated by the family of Harry Black. This multi-generational operation is always adding and improving its offerings and looking for ways to grow. They are located in Thurmont, MD. 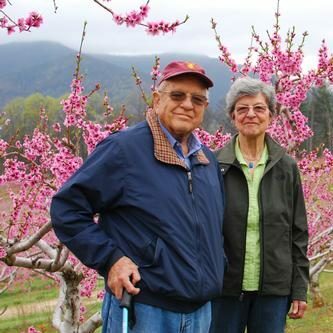 One of the region’s most accomplished growers of a wide variety of vegetables and tree fruits, the Hollabaugh family’s now four-generation orchard began in 1955, founded by twin brothers Donald and Harold (pictured with Anne) Hollabaugh. Their children, and children’s children, have carried on and expanded the orchards and opportunities. Best of all, the family is absolutely committed to applying the highest standards of food and environmental safety to everything they grow. Whether you spend time on their website or take a day trip to the farm, we encourage you to learn more about this wonderful farm and family. 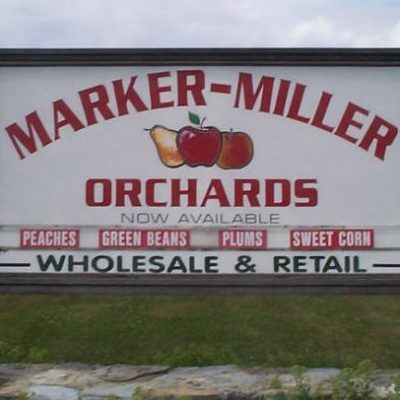 Founded in 1908, the Marker-Miller Orchard has passed through the generations and is owned and operated by John Marker and his family. Their farm, orchard and bakery is a wonderful destination. 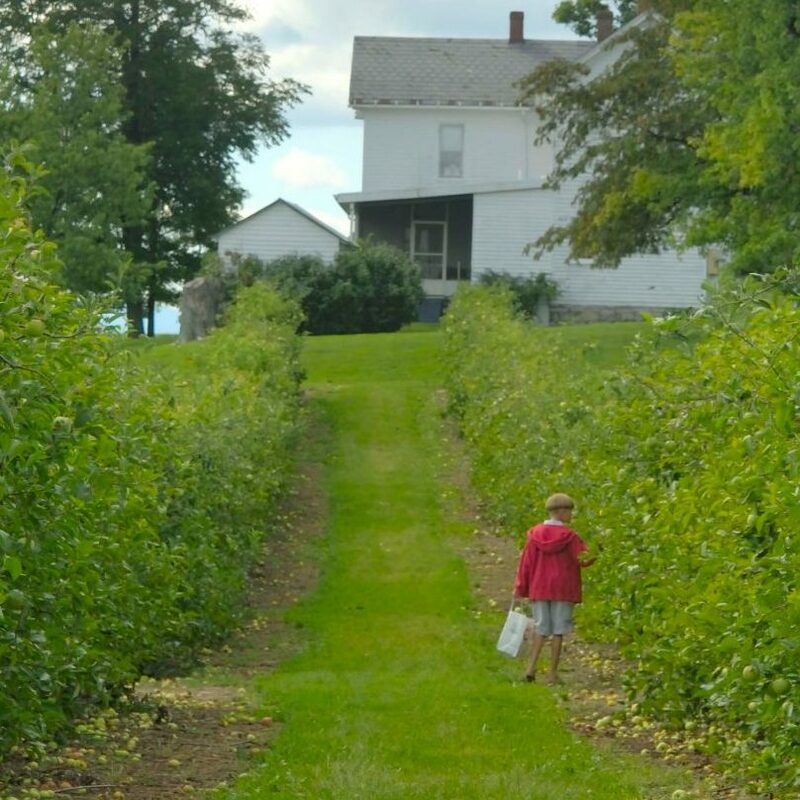 Founded in the 1850s, Mountain Valley Orchard and farm has been owned and operated by the same family for 5 generations near Fredrick, MD. Good neighbors are a blessing, and good neighbors who farm–they are worth their weight in delicious fruit! 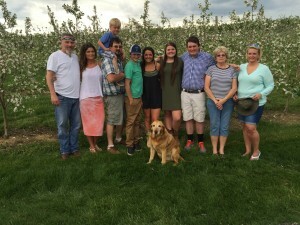 The Rice family has owned Hanovertown Farm for many generations.Their diverse pursuits include cattle and grain production, as well as the only fruit “annuals” we include in our CSAs each year–cantaloupes and watermelons. Rinker Orchard is a third-generation apple orchard not far from Winchester, VA, including pick-your-own apples. Dudley Rinker added the cider press in 1986, which has expanded greatly over the years, currently producing more than 100,000 gallons of flash-pasteurized apple cider that is adored by loyal fans every Fall. Founded in 1915, the Saunders Brothers nursery, orchard, bakery and market are all still run by Paul and Tatum Saunders, their sons, and grandchildren in Virginia’s Nelson County on the Piney River. Emmett and Ellen Snead begin farming the same year as Anne and Chuck, and they have worked together ever since. Emmett is a life-long farmer and his family-owned and operated farm grows a wide variety of perennial and annual crops–from tomatoes to eggs to Christmas trees. Also he offers his own CSA from his farm, and has a variety of interesting articles he has written on his excellent website. We highly recommend that you plan a visit to his beautiful farm and extensive conservation area. Wenger Vineyard, begun in 1938 by Paul Wenger, is now operated by his son, Dave, and Dave’s wife Mim. We love the care they take throughout the growing season to be sure their fruit is safe and delicious. They also offer pick your own opportunities during the September harvest, details on their website.